The far-right party VOX has requested prison sentences of 74 years for each former Catalan minister on trial for organising a referendum and declaring independence last year despite Spain’s opposition. 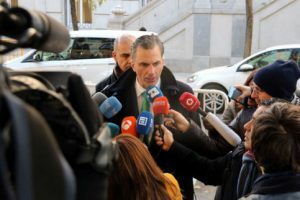 Vox’s proposed sentences almost triple those proposed by the Public Prosecutor (25 years for vice president Oriol Junqueras and 16 years for the other ministers). The Attorney General, representing the Spanish government in the case, requested 12 years. The party, which in recent years took Catalan leaders to court in several occasions, accuses each ex-minister of criminal association, misuse of public funds, and two crimes of rebellion – one of the most serious offenses in the criminal code. While the Public Prosecutor charged pro-independence leaders with the crime of rebellion, the Attorney General ruled it out and requested prison sentences for the lesser offenses of sedition and misuse of public funds. Vox also demanded prison sentences of 62 years for Jordi Sànchez and Jordi Cuixart, two activists and civil society leaders involved with the referendum. In the last Spanish election, Vox only got 0.2% of the votes. Yet, recent polls suggest that they could get some MEPs in the upcoming European election and even some representation in the Spanish congress.